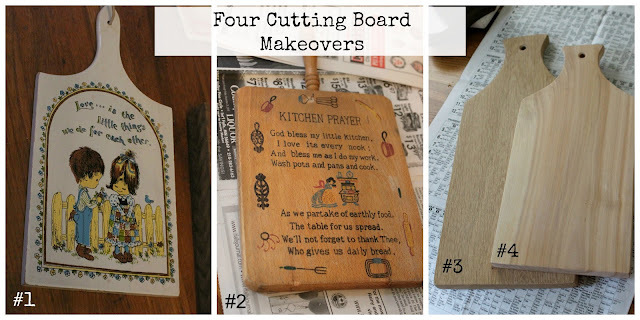 Four Thrift Shop Cutting Board Makeovers! I always pick up cutting boards or breadboards at garage sales and thrift shops. I recently picked up these four boards, and gave each a whole new look. Cutting board number one was a knock off of the 1970's "Love Is..." fad. I gave cutting board number one two coats of Annie Sloan Chalk Paint in Pure White. Next I stenciled on this Farmers Market crate sized stencil I purchased at Michael's with black craft paint. The stencil is made by Plaid. Then I distressed the board a bit with 220 grit sandpaper, and added a jute tie to the hole at the top. Here is cutting board number 1 after the makeover! Cutting board number 2 is an older cutting board as well. This one has a kitchen prayer painted on one side. I think my Grandma had one like it. I painted this board with Fusion Paint in Algonquin, and used the same Plaid Farmer's Market crate stencil. I also distressed the board and added a jute tie. This cutting board was a bit narrower than the other so I stenciled the words on sideways. Finished makeover of cutting board 2! Cutting boards 3 and 4 were made by a home woodworker and never used. The makeover of cutting boards 3 and 4 involved the wood box above. The ends of the box were sawed off and then attached to each cutting board. I guess this could be called a "cheater build". The wood box ends were simply screwed into the cutting board from behind. Then cutting boards 3 and 4 with attached box parts were painted with Annie Sloan Chalk Paint. They were sanded with 220 grit sandpaper and stenciled. Cutting board number three hangs on the wall as the shelf is not flush. 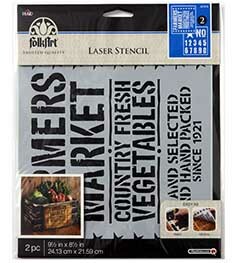 The stencil "farm" is from Funky Junk Interiors "Farmers Market" set. A small crock fits perfectly in the box shelf. I have some smaller utensils in the crock but flowers or candles would work too. I like the addition of the box to cutting board number 3. Finally, here is cutting board number 4. I am keeping this one. I love the grain stripe stencil from Funky Junk Interiors Christmas Blend Hot Cocoa set. A chalk painted jar, with teaspoons, fits in the box perfectly. Great for a coffee area! How fun is this vintage Universal coffee urn I picked up thrifting today? Great display piece. Many cutting boards have a very rich and worn patina and are great for display without any paint, or stencils. But if you find those novelty boards, give them a whole new look! I love 'em all! Great idea to use that pre-made box. Thanks for sharing your cutting board makeovers at Talk of the Town. They all look so good! Clever use of an old box too! The stencils are fun. They turned out great! Going to keep an eye out for some cutting boards. Haven't seen any lately at the thrift shops. You always come up with such fun projects, Carlene...the cutting boards really turned out well! Very cute and farmy! Love everything you do! Really fun Carlene! I gave three cutting boards some grain sack stripes a while back and still love them. Love your cutting board magic!!! Beautiful job. Love all four of your makeovers! Can't wait to make a few of my own. If you have a minute I would love for you to share at Vintage Charm. Carlene, LOVE your cutting boards turned in to signs and and my fav - faux grain striped. Pinned. all great cutting board makeovers! I love the grain stripe! thanks for linking up to Talk of the Town !! Gorgeous, all of them. You are so talented,Carlene! Awesome ideas! #4 reminded me of ae milk bottle too..thanks for sharing!. Great recycle with the cutting boards. Genuis.